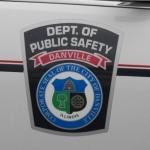 Danville Police are looking for a lone suspect in connection with the armed robbery of a Dollar General Store Tuesday evening. Police were called to the store in the 1400 block of North Bowman Avenue shortly after 6:30 p.m.
Employees told police the business had been robbed by a black male armed with a knife. The suspect fled after being given an undisclosed amount of cash. There were no injuries. The suspect is described as a black male about 5-feet, 11-inches tall with a medium build. He was wearing a red hooded sweatshirt and grey pants and was last seen running west from the store. Anyone who has information that might help solve this crime is asked to call Danville Police at (217) 431-2250. Or you can call Vermilion County Crime Stoppers at (217) 446-TIPS.